by Johnson & Johnson (Phils.) Inc.
Used as part of protection and treatment for minor cuts and wounds. 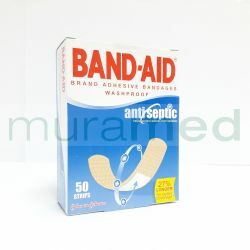 Antiseptic washproof strips that helps protect wounds from bacteria. Clean area thoroughly with soap and water. Dry well and apply adhesive bandage. Change dressing daily or if pad becomes wet.